Une éruption explosive en Tanzanie du volcan Ol Doinyo Lengaii en 1966. L’activité explosive a démarré en août 1966, près de la fin d'une phase éruptive qui avait débutée en 1960 et qui se résumait à des émissions silencieuses de coulées de lave dans le cratère sommital. Les dépôts de cendres provenant d'éruptions précédentes blanchissent les pentes du volcan comme de la neige. (Photo par Gordon Davies, 1966 / gracieuseté de Celia Nyamweru, Université de Kenyatta). Style éruptif tipique: Explosive activity. In addition, at least during the past +-30 years near-continuous effusion and mildly explosive eruption of natrocarbonatite lava from vents inside the crater, sometimes overflowing over the rim, is taking place. 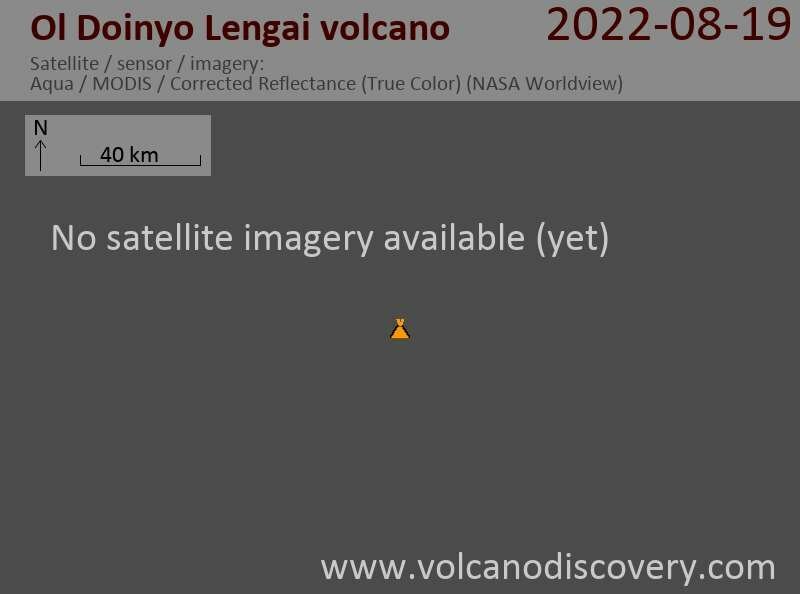 Ol Doinyo Lengai is an extremely fascinating volcano: it is the only active volcano known to erupt carbonatite lava, a sensational discovery scientists made as recently as in the 1960s: the lavas it erupts are NOT melts based on silica, but on natroncarbonate! Thus, the temperatures of these lavas are much lower, "only" about 600 deg. C., and Lengai's lava does not emit enough light to glow during day,- only at night, a dull reddish glow that does not illuminate anything is visible. Also because of its peculiar chemical composition, the lava is extremely fluid and behaves very much like water, with the exception that it is black like oil. After it is cooled down it quickly alters and becomes a whitish powder. Geologically, the present-day cone of the volcano was constructed about 15,000 years ago. Historical eruptions have been moderate to small explosive events. In addition to its intermittent explosive activity at intervals of typically years or decades, numerous natrocarbonitite lava flows have been erupted from vents on the floor of the active summit crater. The depth and morphology of the active (northern) crater have changed dramatically during the course of historical eruptions, ranging from steep craters walls about 200 m deep in the mid-20th century to shallow platforms mostly filling the crater. Long-term lava effusion in the summit crater beginning in 1983 had by the turn of the century mostly filled the northern crater; by late 1998 uptill today lava had begun overflowing the crater rim. The majestic cone of Ol Doinyo Lengai stratovolcano and the grassland at its feet seen from the NE. The tall hornito T49b in its active crater is well visible. De même pour les phases précédentes, nouvelle natrocarbonatite lave est étant éclaté d'évents au fond du cratère nouvel. Si cette activité se poursuit, il pourrait remplir à nouveau le cratère.